We are indebted to the late Terry Mordue for his painstaking work in converting these articles and poems into HTML, formatting them, and adding many ✎ annotations (in general, the numbered footnotes are Terry’s, where not otherwise credited). Be sure to visit his webpages relating to PGW, now hosted on this site. Additional ✎ notes have been added , including artwork for the “Academy Notes” where available, with additional proofreading by Neil Midkiff, Ian Michaud, and Karen Shotting. 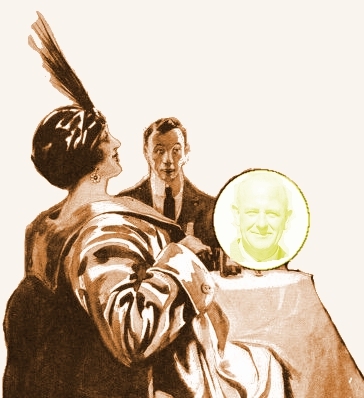 Wodehouse contributed two reviews to the November 1905 issue, according to his account book, but the issue contains 25 unsigned reviews; as far as we are aware, no attempt has been made to determine which two were his. 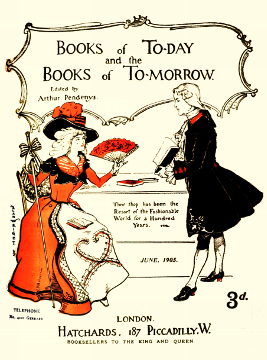 Called “about the most lively English bookseller’s catalogue now issued,” The Books of To-day and the Books of To-morrow was published by Messrs. Hatchards, an old established bookseller’s firm in Piccadilly. Wodehouse’s contributions to the magazine were unsigned, but through February 1908 are confirmed by his entries in his account book Money Received for Literary Work. They consist of topical humorous paragraphs and verse, consistent in theme and style with his contemporary journalism in other periodicals. We are working on adding ✎ annotations to place this topical material in the context of the celebrities and news issues of the day. In some cases, a frequently-mentioned name may not have a specific footnote on every page where it appears; using the Search box in the right sidebar of Madame Eulalie’s Home page is a good way to check whether we have notes pertaining to that name on another item on this site.